An update of this review can be found at okgourmet.com . 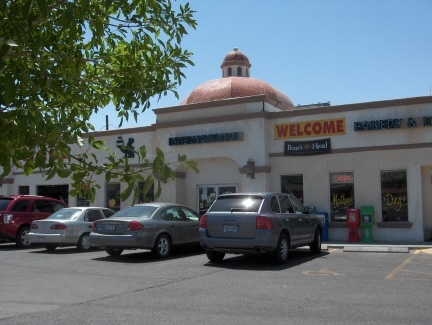 International Bakery and Deli opened after I began posting information about restaurants in El Paso, but the food is not new to local patrons. The sandwiches and baked goods were previously served at the Lo Mart Delicatessen, a large dining area in possibly the most upscale grocery store that has ever existed in El Paso. Lo Mart is now closed, but the head pastry and sandwich chef from the west side store opened International Bakery a short distance away on Mesa Street. 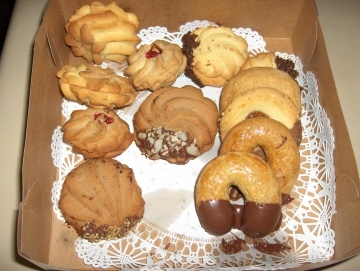 Lo Mart specialized in European foods such as German cookies, French cheese, and Italian meats. 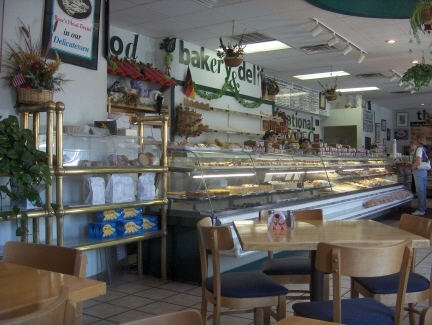 International Bakery does not carry as large a selection of imported goods, but the "deli" portion of the business continues the tradition of providing high quality food from various parts of the world. Meats and cheeses are available, with Boar's Head being one of the featured brands. One of the allures of a delicatessen is that food can either be consumed on premises or taken home, no waiters are employed, and customers do not have to leave a tip. While I have enjoyed the same casual setting of cafeterias such as Luby's quite a few times, an argument could be made that International Bakery has much better food. At least in terms of freshness and high quality meat, I think International Bakery is one of the best in El Paso. It does not have the variety of foods served in a cafeteria, so you would have to be in the mood for the type of things International Bakery serves. The thing that impressed me the most, though, was the food quality. Lo Mart had a more comfortable and upscale dining area than is found now at International Bakery. I even dislike the parking lot at International Bakery from which it is hard to enter and exit from the busy Mesa Street and access to the side street has been blocked. International Bakery took over a Mexican buffet restaurant, and they are doing the best they can with the building. The main thing is that the food is just as good as that which used to be served at Lo Mart. 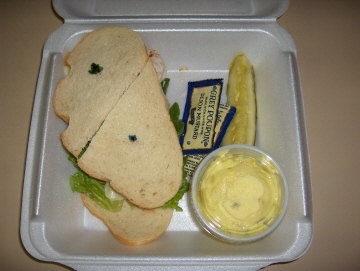 Sandwiches and a few other items, such as tuna salad, are available from the counter. Sandwiches are both hot and cold, and come on a variety of breads. I used to enjoy the sourdough bread at Lo Mart and it seems to be the same at International Bakery. One nice touch is a fresh pickle that comes with every order. The Chicken and Swiss Sandwich I tried showed the freshness and quality of ingredients that was somewhat surprising compared to the normal standard for El Paso, but should not be surprising for those who have been to the Lo Mart deli. The sandwich is not even all that expensive considering that it comes with a side dish and large slices of bread that are fresh and filling. The Potato Salad that comes as a side dish is mustard based, and although not great in quantity, was very fresh and flavorful. Again, it was exactly as I remembered from Lo Mart. The Wiener Plate can be served as a sandwich or as a lunch plate, but the choice of bread that comes with it makes it easy to construct a delicious sandwich with hot German mustard. 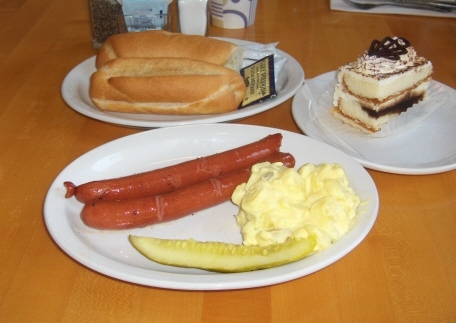 The German wiener, as served at International Bakery, is leaner than the American style hot dog without all the mystery meat. I generally stay as far away as possible from hot dogs served in restaurants, but the wiener plate here was delicious. 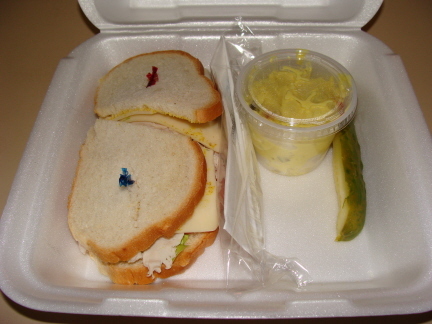 The Turkey and Swiss Cheese Sandwich is one of the better cold sandwiches, Just as I enjoy cold turkey sandwiches possibly better than Thanksgiving dinner itself, I think the sandwich at International Bakery does not fall short of my ideal for a turkey sandwich. This one comes with Swiss cheese, and while the turkey itself is processed, it is better than about ninety percent of the processed turkey I have eaten. Some of the grocery store delis also serve good processed turkey, but I have found the one at International Bakery to be much fresher. A meat counter sells a large variety of meats (mostly lunch meats) and cheeses that you can buy by the pound or fraction thereof. I would say these are mostly imported goods, but it could be that more than half are American (I remember that at Lo Mart most were imported). I would think it would be the sandwich shop that would shut down after the lunch period, but actually the meat counter is the only part of the store that closes early, with only whole packages of cheese or meat available after 5:00 p.m., an hour short of the store's closing time. The baked goods may be the main attraction of International Bakery, with so many different types of cakes and cookies it would be almost impossible to sample all of them, let alone review them. There were a few at Lo Mart that I particularly liked, but really there were none that I did not think were worth sampling. I was pleasantly surprised to see the same items available at International Bakery and Deli. While the meat counter seems to be slightly smaller now, if anything the bakery counter may be larger than before. I guess the owner knows what west side customers like.